When Whovians discuss which episodes of classic Doctor Who make the perfect entry point for newcomers, one that frequently comes up is City of Death. Co-written by then-script editor Douglas Adams (of Hitchhiker’s Guide to the Galaxy fame), City wasn’t just funny, it also employed a clever sci-fi plot in which a scheme to steal the Mona Lisa became a threat to the very origin of life on Earth. Add to that scenes of Tom Baker and Lalla Ward cheerfully swanning around famous Paris attractions, and even a cameo by John Cleese. Scaroth, Last of the Jagaroth! “Last of the Jagaroth” was no idle boast. Scaroth truly was the only surviving member of his race, and even he was barely hanging on. During a failed attempt to blast off from primordial Earth, the sole remaining Jagaroth spaceship exploded, spreading Scaroth across time. Splintered into twelve fragments scattered throughout history, Scaroth’s avatars worked together to influence human development. Their ultimate goal was to build a device that would allow them to travel back hundreds of millions of years and prevent the ship’s destruction. If massive mucking around with the timelines wasn’t enough to get the Doctor’s attention, there was also the little matter that the radiation released by the exploding Jagaroth craft kickstarted the primordial soup that eventually led to all humankind. How did the Mona Lisa figure into it? Well, you see, one of Scaroth’s splinters was buds with Leonardo da Vinci, and convinced the artist to paint six copies of what would eventually become his most famous work. Centuries later, another splinter was able to steal the original from the Louvre, then sell seven genuine Mona Lisas to finance his time-travel experiments. I told you it was clever. 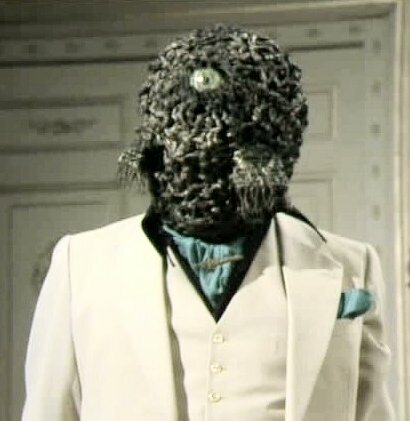 His final avatar, Count Scarlioni, was a well-respected art lover married to a beautiful human woman played by Catherine Schell. While it wasn’t explicitly laid out, it was pretty clear that the Countess realized that she was playing the role of a “beard.” But even she didn’t realize the true nature of the Count’s secret life. Tomorrow: they call him Mister Sin!